Yesterday a local thrift store marked everything half-off. I bought a stack of 6 teak trays for $1.98. Remember my rule of thumb? When a serving piece costs less than its disposable counterpart, consider buying it for hospitality. Not only does this save money, but an attractive serving piece often makes your whole contribution look better! Oh, wow! That really is a great deal! And that's a really nice idea about using those things for hospitality, rather than disposable trays. I tend to go the disposable route, but that's typically because whatever I'm giving needs to be popped in the oven. I should start checking out thrift stores for nice casserole dishes and such. I have taken part in the Labor Day 1/2 off sale at our thrift shop in years past. I just wasn't up to standing in the check out lane for an hour this year. I don't know how you did it being pregnant. Thanks to your great idea I now have begun a small collection of serving pieces that will have a "no return" tag on them when I give the gift of food. Teak!! Thrifted serving pieces in teak!!! Do me a favor... flip one of those trays over and if Dansk is inscribed anywhere on the back of it DO NOT give it away or "dispose" of it in any way whatsoever. You may have happened upon a nice little collection of valuable, midcentury modern serving trays. These say "teak, made in the phillipines" on a sticker. They're too scratched to be valuable, but I will check for Dansk from here on out! Meredith, thanks so much for this! Everytime I read your blog I feel inspired to "share my bounty" with others! I'm now thinking of some women in my church who are feeling particularly overwhelmed that I can make something nice for. Thanks for poking us into hospitality! Great find! I love wood trays. 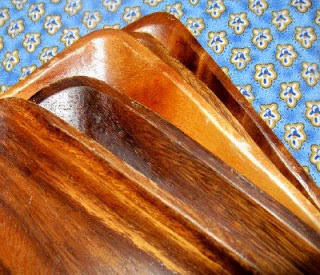 There are a bunch of knock-offs of the original Dansk teak serving pieces. However, if you find one marked with any combination of the following... "Dansk", "Denmark", or "JHQ" or "IHQ" (the initials of Danish designer Jens Quistgaard) then you've most likely happened upon a nice midcentury modern collectable. I think this is an excellent idea and kind of hit on this idea recently myself. I often look at the local Bibles for Missions for oven ware. I enjoy getting 'new' casserole dishes and I don't mind telling the recipient of a meal that they can keep the dish if they choose. So far I've only got the dish back twice because they said they already had enough. The rest of the time the people were happy to keep the dish. I just discovered your blog & it's my first blog stop for the day. I love the serving trays. I live by your Motto too. I can't bear to serve anything in disposable. You can find the cutest serving items cheap. Thank you for all the great ideas. I'm a frugalite too but I think your blog is one of the best decorating blogs around. such a timely post - we have recently moved from South America to Nordafrica, thanks to you I am not (too) afraid to have 2 friends over for whine and cheese tonight, even if we only have a table, four chairs and 6 plates, our container not arriving before October. The kids will eat earlier and we will sure enjoy the company of our friends - the most 'casual' event I have haver hosted for sure...Now, please tell me how I will be able to organize "something" for my oldest's birthday in September with the new friends he is making at school with "just about nothing"
People do not tend to mention this: but avoiding disposables does not only mean avoiding using hideous pieces but it is the environmetally friendly thing to do! A friend of mine always buys lovely platters for next to nothing at yard sales. She then uses them to bring whatever goodies she prepares to parties and leaves the platters for the hostess as a gift. She is a lot like you.